Life is still super busy, so apologies again for a late post. So, here comes another double header: week 41 today, and week 42 tomorrow. 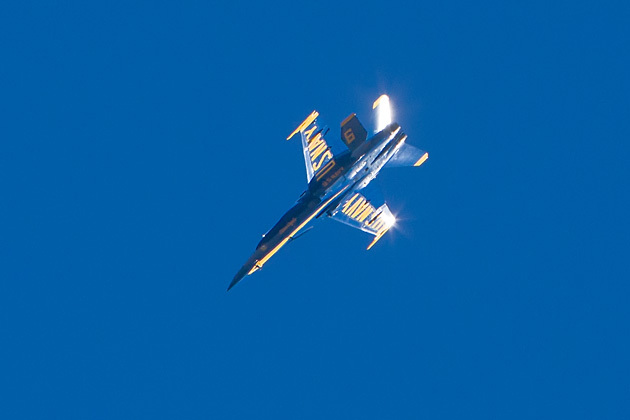 Almost every year, I take photos of the Blue Angels as they fly over our neighborhood, but I usually don’t post them. This year, we had particularly clear blue skies and I got a few nice shots. You can see a small gallery of photos I took this year. Some of the shots were taken from a much closer distance, and therefore required much less cropping and have much higher resolution. Others show multiple planes in formation. However, I still like the shot posted here in particular. I think the glint off the wing and tail section just sets it apart from the other photos. The plane was making a fairly rapid turn, and the reflection happened for probably just a second, so I just had to be fast. I did have this particular effect in mind beforehand, so I was just waiting for an appropriate maneuver, and then took multiple frames in high speed mode to make sure I got just the right moment. This entry was posted in Picture of the Week and tagged aviation, outdoors, photography. Bookmark the permalink.